Here are some new photos of the 'alleged' motte at Bird's Park Farm. 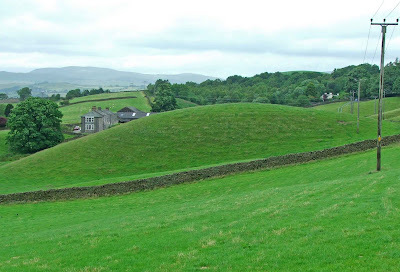 The well pronounced mound can be found just off the Old Sedbergh road. Previous photos of this site were taken of an area incorrectly indicated by the Pastscape web site. The site indicated was a very low mound, not really well defined. However, whilst scanning Google Earth a while back, I noticed that this mound lay literally a hundred yards to the East across the other side of the Kendal to Windermere railway line. So...after climbing a few nettle clad walls, and skinning my knees and shins, here are some photos of the mound probably mistakenly identified as a motte by some historical references. It is highly unlikely that this mound represents anything other than a naturally occurring round hill in a landscape of rolling and undulating glacial deposits. For example, a hundred yards to the South in the grounds of the Castle Green Hotel, there is yet another 'round' hill, standing out in the middle of a walled field. This mound has some mature trees growing from its summit, and for all I know, may be the 'motte' that Pastscape mentions. From discussions with other interested parties, this mound bears none of the traits that a motte and bailey castle should posses. There appear to be no earthworks around the base of the mound, which would indicate filled in ditches or flattened banks, and there doesn't appear to be any area that could once have been a 'bailey'. This site can most likely be discounted as a motte and bailey castle...or even a pre-Norman administrative centre, as Pastscape calls it. The photos are here purely to demonstrate how easy it is to identify any and every mound as a potential motte and bailey castle.